Cookistry: Mushrooms with Eggs in Tomato Sauce from SHROOM!!! Mushrooms with Eggs in Tomato Sauce from SHROOM!!! I have always loved mushrooms. Always. With mad passion. When I was a little kid, if you asked me what my favorite food was, I wouldn't have said chocolate or potato chips or peanut butter. Nope. I would have said mushrooms. Pizza was good, because it came with mushrooms. Spaghetti sauce had mushrooms. Mushrooms were good all by themselves, cooked or raw. Back then, all mushrooms were white button mushrooms ... well, except the odd ones in the Chinese take-out. But otherwise, they were all the same. Now, I know that there are a lot of different mushrooms, each with their own fun-guy personalities. And I love all of them. 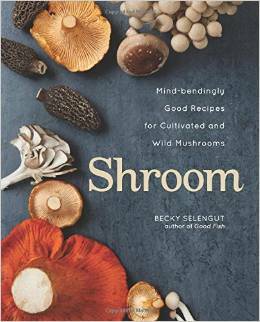 So when I got the book Shroom by Becky Selengut, I had about half of the recipes bookmarked. I wanted to make ALL of the recipes. But I had to decide which one to make first. That's always the tough choice. The book is organized by the type of mushroom, but for some recipes, you could certainly substitute one for the other. The one I kept coming back to was Portobello Shakshuka with Baked Eggs and Israeli Feta. The idea was that you had a tomato based sauce with big mushroom caps holding eggs that baked to an over-easy consistency. I had really good intentions about buying the exact ingredients I needed. Really I did. But then I had leftover pasta sauce, and I had mushrooms ... and I always have eggs. So I figured I'd whip up my own version of it. My mushrooms were a little small, so the egg didn't stay in the first cap I tried. I needed bigger shrooms or caps that were more cupped. The next caps, I cooked in ramekins, so the eggs couldn't spread. But the presentation wasn't a big deal. It tasted good. And the yolk blended with the sauce in a really interesting way, making it seem creamier. I'm thinking this egg-in-a-mushroom thing could work for other things, too. Like a bed of rice, and then mushrooms topped with the egg sitting on the bed of rice. Or mushrooms over a nest of bean sprouts and shredded zucchini. Nice, right? Anyway, if you want the original recipe from the book, just go to Amazon and do a search in the book for Shakshuka and you'll see it. Or, you know, buy the book . Clean the mushrooms. Cook in the sauce in a saute pan until they're as done as you like. Arrange the mushrooms with the gill-side up. Crack an egg into each mushroom cap. Cover the pan and continue cooking until the eggs are as done as you like. Serve the mushrooms with the sauce. Do ahead: Cook the mushrooms and sauce ahead of time, then refrigerate. When you're ready to serve, cook the eggs in the mushroom caps in the sauce. The sauce and shroom will reheat in the time it takes for the egg to cook. I received the book from the publisher. Meatloaf! 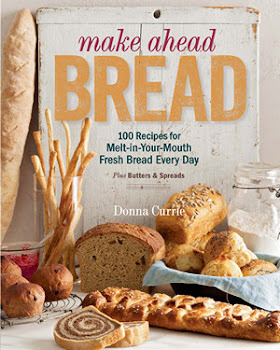 File this one under "not Mom's"
Bread Shaping Technique - AMAZING video!